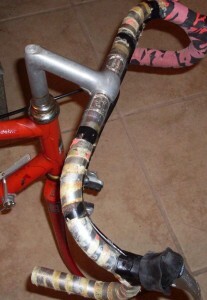 I wanted to re-wrap the drop handlebars on my vintage road bike this week. I watched a couple of YouTube videos on how to wrap handlebars in preparation for the project. The videos I watched showed the new tape being installed on clean bars. They also showed that the new bar tape did not have any adhesive on it. However, when I pulled off my old tape I was disappointed to see that it had a sticky adhesive that stayed on the aluminum bars. I started with plain soap and water hoping that it would do the trick. I used a kitchen sponge that had an abrasive side. It was not a heavy abrasive since I did not want to scratch the soft aluminum. The soap and water helped to soften the rest of the old bar tape so that I could get off the sections that were still stuck to the handlebars. However, the soap and water didn’t do much for the sticky adhesive. Knowing that WD-40 is good for removing sticky stuff, I gave that a shot. It took a bit of elbow grease, but it eventually softened up the glue and took off the goo. I used the aforementioned sponge to help scuff away the sticky stuff and make the bars shiny again. The biggest problem with the WD-40 is that it leaves a greasy residue after you get the old tape off. You need to clean it well with regular soap and water. 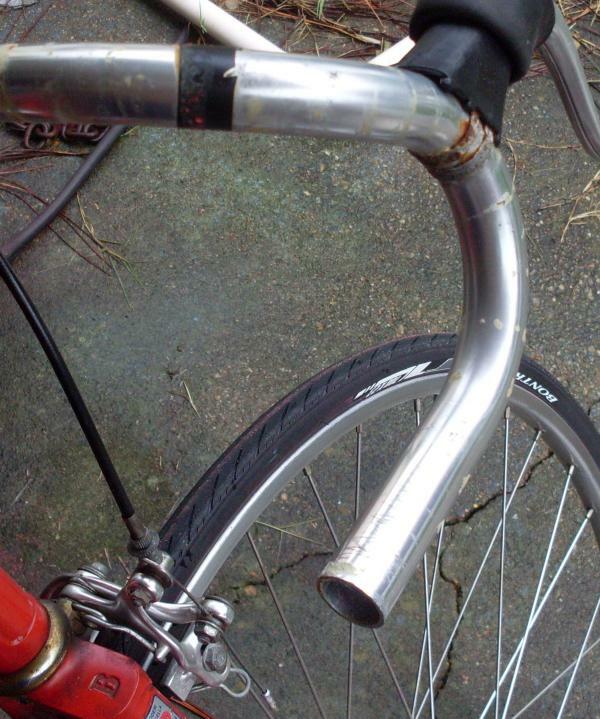 This will help your new bar tape adhere to the handlebars. When spraying the WD-40 onto the bars, you need to be careful and not get any on your rims or brake disks. Doing so will make your brakes less effective. It could possibly make your tires slick too. WD-40 is great for what it does, but most of the time it is best to keep it out of the bike shop. I found Specialized S-Wrap Cork tape at my local bike shop. They told me that there was plenty of tape to wrap the bar and have some left over. I wrapped it as carefully as I could and still could not make the grip tape cover the bars sufficiently. I was only short about 4 inches from what I wanted to do. Either I overlap too much, or I don’t have the same concept of “plenty of tape” as the bike shop guy. Here is the video I found most helpful when getting ready to tackle this project.